BTS is an abbreviation of the Korean words Bangtan Sonyeondan, which literally means “Bulletproof Boy Scouts”. Many English-speaking fans simply call them Bangtan Boys. In 2017, the group said BTS also stood for “Beyond the Scene” as part of its new brand identity. After training for around three years, BTS debuted in June 2013 with the album 2 Cool 4 Skool, which included the lead track “No More Dream”. One thing worth noting is that BTS, from day one, has highlighted thematic concepts, weaving together series of songs, albums and materials, which BTS describes as its own “narrative”. This also makes up the Bangtan Universe, a fictional universe centering on a series of music videos, songs, album notes, short films and most recently webtoons. These overarching concepts have changed over time, so let’s take a look. The first “School” trilogy kicked off with the debut album 2 Cool 4 Skool in June 2013. In September that year, BTS dropped the second installment of the saga, the EP O!RUL8.2?, followed by the final part, the EP Skool Luv Affair, in February 2014. Some of popular songs in this era of BTS include “No More Dream”, “N.O.”, “Boy in Luv” and ”Just One Day”. Later that year, BTS released its first full-length album Dark & Wild, featuring popular tracks “Danger” and “War of Hormone”. In April 2015, BTS released The Most Beautiful Moment in Life, Pt. 1, kicking off the “Youth” series with the theme of the beauty of youth and its uncertainties. Riding on its newfound popularity, BTS dropped the second installation, The Most Beautiful Moment in Life, Pt. 2, in November. Fronted by the single “Run”, the album became its first album to land on the Billboard 200 at No. 171. In May, the compilation album The Most Beautiful Moment in Life: Young Forever rounded up the “Youth” cycle, with new hit tracks “Fire,” “Epilogue: Young Forever” and “Save Me”. Later that year, BTS continued to break its own records with its second LP, Wings, fronted by the hit track “Blood, Sweat & Tears”. Following the success, BTS released the extended album of Wings, called You Never Walk Alone, which featured chart-topping songs like “Spring Day” and “Not Today”. In 2017, BTS began a new era with the acclaimed “Love Yourself” trilogy centering on the theme of self-love. The EP Love Yourself: Her” released in September that year, became the first K-pop record to debut in the top 10 of the Billboard 200 chart, landing at No. 7. 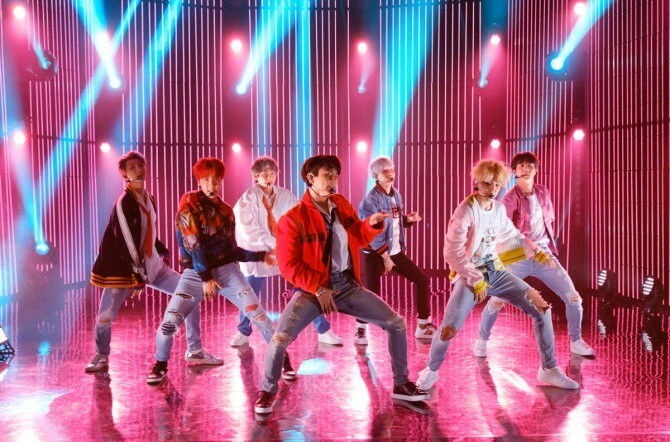 The lead track “DNA” and “Mic Drop” -- remixed by American DJ Steve Aoki -- reached No. 67 and No. 28, respectively on the Billboard Hot 100, the top singles chart. Continuing the series, in May, BTS dropped its third full-length album, Love Yourself: Tear, which debuted at No. 1 on the Billboard 200 chart, becoming the first and only K-pop act to top the chart. Leading the album is the track “Fake Love”, which made a record-breaking debut of No. 10 on the Billboard Hot 100. In just three months, the “Love Yourself” trilogy came to an end with its final installment, Love Yourself: Answer, a compilation album consisting of the lead single “Idol” and songs and remixes from the previous “Love Yourself” series. Big Hit Entertainment captain Bang said BTS bandmates are given the freedom to create what they want for their music. The members were trained to write and produce their own songs from the beginning -- because that is the only way to tell an authentic story of the band and its members, he emphasized. BTS has even infused its songs with classic literature like Hermann Hesse’s “Demian”. In doing so, the bandmates came across as much more personal, down-to-earth and sincere. By posting selfies, funny videos, food they ate and their home, it brought followers one step closer to the life of the stars. They managed their own social media presence in their own language and without hiatus. BTS posts something almost every day. Unlike other K-pop idol’s accounts that are operated by agencies, Big Hit stressed that it was important to give BTS autonomy to run its social media accounts.